Acrobranch activities can be dangerous. Be careful and listen to your guide. Don’t bring unnecessary possessions with you. Tell us of any relevant medical condition that you have (and if you have one your doctor must have agreed that it is still safe to do the Acrobranch activities). You indemnify Acrobranch and all their employees and agents from any damages (direct or indirect) which you or your child may suffer because of going on the activities. If, for example, you book for 10 people but only arrive with 8 people, you will still pay for 10 people. If you want to ensure that you have a booking, then you need to pay a deposit. Acrobranch cannot guarantee that you will be able to participate in the activities if you do not make a booking. Please read our refunds terms below to see when we provide a refund. 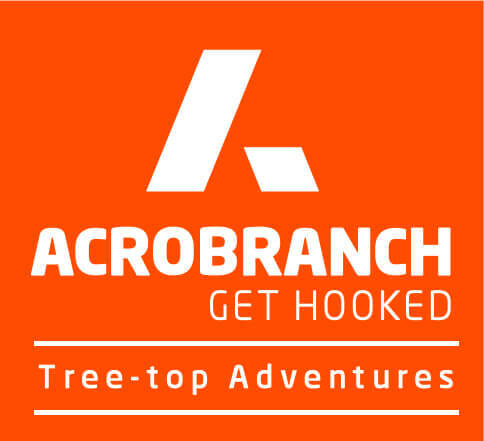 Acrobranch Adventure Park CC (‘Acrobranch’, ‘we’ or ‘us’), is a close corporation that provides adventure activities to the public which are considered to be extreme sports (and also fun). Please read our terms and conditions carefully as they govern your relationship with us. You must provide your details before you use our Web Site to book activities. You agree that the information you provide will be complete and accurate. All bookings will only be confirmed after receipt of a 100% deposit into the Acrobranch bank account and proof of payment has been emailed to us. NB: Your booking is not confirmed until you have sent proof of payment to us. You did not book for the right activities. All prices on our Web Site are inclusive of VAT. If Acrobranch gives you a discounted rate, it will only be applicable if the deposit is paid: in other terms, if you do not confirm your booking by paying the deposit but you choose to come anyway, then, if we can accommodate you, you will not get a discounted rate. Payment may be made via Visa or MasterCard credit cards or by bank transfer into the Acrobranch bank account, the details of which will be provided on request. Online credit card transactions will be acquired for Acrobranch via PayGate (Pty) Ltd who are the approved payment gateway for Standard Bank of South Africa. Customer details will be stored by Acrobranch separately from card details which are entered by the client on PayGate’s secure site. For more details on PayGate refer to www.paygate.co.za. a 15% surcharge on deposits for bookings for less than R5000. a 10% surcharge for amounts larger than R5000. Refunds, if or when valid/applicable, will only be paid to SA bank accounts. Returns are only accepted within 30 days of the date of cancellation. We will only refund amounts that have been in our account for a total of 7 days. More than 6 days before your activity, full refund on amounts paid will be made less a 10% admin fee. Less than 6 days and more than 2 days prior to your activity, a refund of 50% will be made on amounts already paid. 24 to 48 hours prior to your activity, a refund of 20% will be made on amounts already paid. No refund will be made if your booking is cancelled less than 24 hours prior to your activity, in cases of adverse weather, we reserve the right to judge weather conditions and if the booking is cancelled by Acrobranch, a voucher will be issued to partake on an alternative yet suitable date. Regardless of the above clause, you can reschedule your booking at any time up to 3 days before your current booking. If you simply do not appear on the day and we have not contacted you to cancel your booking (which means that conditions are good and it is safe for people to go on the courses) then you will forfeit all amounts already paid. If we contact you to cancel because conditions are not good on the day of your booking, you will be able to reschedule at no extra cost. If that is not possible, you will be entitled to a full refund of the amounts already paid. If you expect the weather conditions to be bad on the day, you will have to wait and see on the day if the park actually closes due to those weather conditions, to qualify for a refund. If you arrive with less people than you booked for, you will still be liable for the entire fee. If you decide to go on a cheaper course than the one you booked for or have incorrectly booked online, you will still be liable for the entire fee (ie. if bookings are made for children without adhering to the specified age and or height restrictions). If you or a member of your group arrive to participate but change your mind once you have been through the safety briefing (for example if the risks are too big for you) and decide not to participate then we will provide a full refund for any person who decides not to participate for this reason. After the first hour then you will get a voucher for 50% of the value of your booking. Acrobranch takes responsibility for all aspects relating to the transaction including sale of goods and services sold on this website, customer service and support, dispute resolution. We will not be responsible for any damage you suffer if the reason for the damage is your failure to provide incomplete or inaccurate information to us (such as the wrong delivery address or telephone number). Our parks are open to the public and so we cannot police the park to make sure that your valuables are not stolen or damaged. Things like cell phones, wallets and jewellery should be left in the boot of your car as they can fall out or result in you getting hurt. Do not to bring valuable possessions along. If possessions get stolen or result in you getting hurt, we will not be held responsible. Since these are extreme sports it is important that you have no medical condition which would make it unwise for you to participate in our activities. If you are unsure whether you should participate or not please DON’T ask our guides – they are not doctors and cannot give you medical advice. Please contact your doctor and ask them for their advice instead. By signing this form you are declaring that you are not aware of any medical condition (this includes a mental condition such as an extreme fear of heights or being intoxicated or under the influence of drugs) which could compromise your safety and the safety of other participants. Because these types of activities are dangerous you must agree to indemnify us and all of our employees and agents from any claim for damages you may suffer as a result of being hurt in some way while participating on these adventure activities. You also agree that your dependents cannot hold us liable for any damages (whether direct or indirect) which they may suffer. We are not responsible for things that are beyond our control like falling tree branches or bad weather. While we check the trees regularly we cannot control what happens with the trees (and you agree not to hold us responsible for this) so please be careful and let us know if you notice anything unusual. We also cannot control what happens on the ground of the park as the park is open to the public. Please keep a close eye on your kids as they are completely your responsibility when they are on the ground! When signing your indemnity form you accept that we may ask you for an ID document before we grant you access to the adventure activities. Acrobranch often has groups of children that come and enjoy the activities at our parks. If you are bringing children to our park then our general indemnity applies to you and your children. PLEASE NOTE that no children under 3 years old are allowed to participate in the Acrobranch Activities. By making a booking you agree that you are the responsible adult for the children and that you have obtained the guardian’s consent for the child to participate in the Acrobranch activities. We take all reasonable steps to protect your personal information and will only provide your personal information to those parties who require this information in order to process orders and where we are legally obliged by a court of law to do so. ‘Personal Information’ is defined as indicated in the Protection of Personal Information Act no.4 of 2013 which can be found at http://us-cdn.creamermedia.co.za/assets/articles/attachments/47193_37067_26-11_act4of2013protectionofpersonalinfor_correct.pdf. Should you wish to view and correct any information we hold about you or object to the use of your personal information please contact us by email at info@acrobranch.co.za. All intellectual property (this includes copyright, patents, designs and trademarks) contained in the Web Site is either our property, your property or the property of a third person and is not in any way licensed or sold to you. No intellectual property (such as a copyright license) is sold by means of our Web Site. You may not copy our Web Site or any of our intellectual property without our written consent. Any dispute regarding these Terms and Conditions will be resolved in terms of South African law. The successful party in any dispute will be entitled to all legal costs incurred (often referred to as attorney-client costs). We prefer to resolve disputes by means of alternative dispute resolution (ADR) (such as mediation and arbitration) but we will not force you to use them. Please contact us first if you have a dispute so that we can discuss it. The selection of winners will remain final. Finalists and winners will be notified via social media, email, or telephone within 5 working days of the closing date. The winner must claim their prize within 5 working days of notification. If the prize is unclaimed after this time, Acrobranch reserves the right to draw a new prize winner. Delivery of prizes will be confirmed once winners are announced. Due to various factors such as changes in legislation we will amend or change these General Terms and Conditions and the other Terms and Conditions from time to time. Please pay careful attention to the version number of the Terms and Conditions when making any booking as you will be bound by the most recent set of Terms and Conditions.